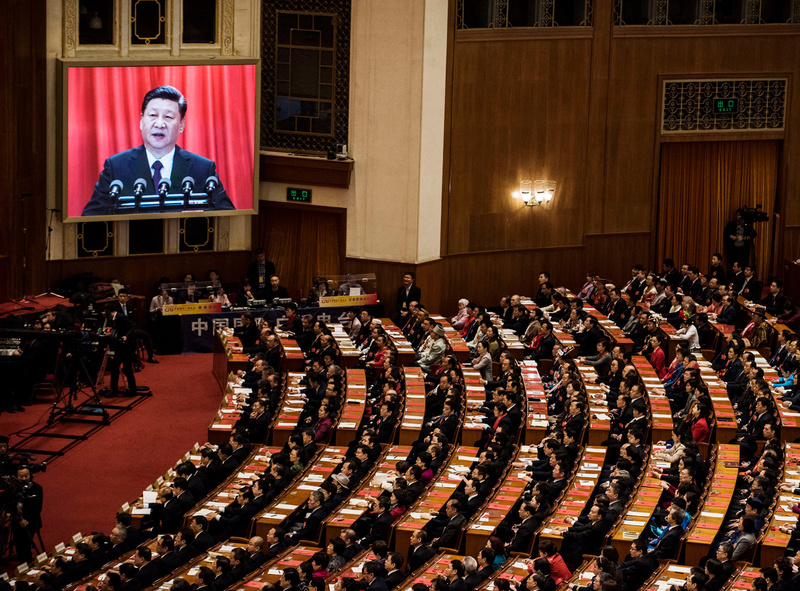 Delegates listen to a speech by President Xi Jinping, seen on a large screen, during the closing session of the National People’s Congress at The Great Hall Of The People in Beijing, March 20, 2018. This piece was first published on the NYR Daily on March 14, 2018. It’s worth noting that the presidency in China is largely ceremonial. Real power resides in leadership of the Communist Party and the Central Military Commission. These are separate positions that Xi already holds and that have no term limits. So, in theory, the change in the constitution wasn’t necessary for Xi to exercise power indefinitely; as head of the Party and military, he already has it. But that misses the huge symbolic power of China’s president. The president is the country’s head of state, which matters greatly in this era of images. It would have been possible, for example, for Communist Party General Secretary—and not President—Xi to visit Washington or Delhi, but that would have made China seem a bit like the Soviet Union, when antediluvian leaders like Leonid Brezhnev met foreign dignitaries amid banners of hammers and sickles. This isn’t how China wants to portray itself to the world. Instead, it wants to be seen as a modern country able to offer a new model for governing—the “China formula” (zhongguo fang’an). China’s political system might owe much to the Soviet Union, but it sees itself as much more than just a successor to that failed state. These terms matter domestically, too. For 25 years, the three titles—head of Party, military, and state—have been united under one person. By dropping the term limits on the presidency, Xi can keep a grip on all three without having a head of state (like a king or queen) who only appears at ceremonial occasions. Such a system wouldn’t work in China. Here, more than in many other countries, ceremony is authority. Television footage of the stately Xi and his stylish wife meeting and greeting foreign dignitaries is a major reason for his popularity; losing that would harm him politically. In hindsight, all this makes perfect sense, but I have to admit I was skeptical last autumn when some political analysts suggested that Xi might try to rule past a second term. One reason was that the Chinese political class has fought hard to institutionalize transfers of power. I wondered if Xi would want to risk alienating so many of his peers by taking such a step. Another risk is that this puts Xi in the crosshairs if his policies fail. Should the economy fail to make the transition to a more modern, technology-driven model, for example, it will be difficult for Xi to blame his premier, Li Keqiang, because Xi has so completely eclipsed Li in economic policy. Mao and Deng had proxies who took the fall for failed policies. Now, it’s Xi standing alone. One person with a different view on this is Russell Leigh Moses, a China-based political scientist who is writing a book on power in China. He made several interesting points: first, that the focus on Xi’s personal ambitions—and the risks he’s taking—may reflect less the dynamics of power in China than the West’s current infatuation with personalities. In decades past, analysts of Chinese politics tended to focus on factions, or at least take them into account in interpreting events in China. Now, as Western politics has become personality-driven, that has become the lens through which the West perceives China. With the West currently obsessed with domestic problems like populism, China has been ramping up efforts to expand soft power into Central Asia and Africa. This is a tremendously ambitious effort that requires the backing of quite different factions in the Chinese government, including finance, diplomacy, and the military. At the same time, the Chinese domestic economy requires serious work—reforms have all but stagnated over the past decade, accounting for the economy’s slowing growth. That has resulted in hard times for many millions of young people, who are unable to get a foothold on the economic ladder. And from the paranoid perch of senior leaders in Beijing, the perceived risks of dissent and unrest are growing as social media and new technologies make it harder to control people. In such uncertain times, having a proven leader at the helm might make sense to many of these groups. As for Deng’s reputation as a crafty, behind-the-scenes operator, Moses said it may be that Xi drew the opposite conclusion. Back in the 1980s, Deng let his anointed successors rise and fall with the political winds, helping to create the turmoil that ended with anti-Party student protests and the Tiananmen Square massacre in 1989. Wang Yi ended his declaration with this small hope: “I plead to the Lord to give a sign, so that among the nearly 3,000 delegates of the People’s Congress, there will be at least one person who will rely on his last bit of conscience and courage to cast a vote of opposition.” Wang Yi’s wish was granted. With government authorities doubtlessly monitoring the voting buttons, the finally tally on Sunday was 2,958 in favor, three abstentions, one invalid—and two against. I wondered who those two were. Did they vote in error? Were they naive, foolish—or people of conscience, a crack in the armor of inevitability? Maybe two dissenters is a laughably low number, but it was one more than Wang Yi had prayed for.